Here you will find everything you need to know about correctly notarized copies. Since TUM does not accept original documents during the application process, we require notarized copies in many cases. It is the only way to make sure that the copies we use to evaluate an application are identical with the original documents. Please refer to your document checklist in TUMonline to find out whether we require a notarized copy of a certain document. Do not send in original degree certificates - TUM cannot assume liability for unsolicited originals. We digitalize all documents and destroy the hard copies after a period of 1 year. Please make sure your notarized copies comply with the requirements described here. If they do not, we cannot accept them. 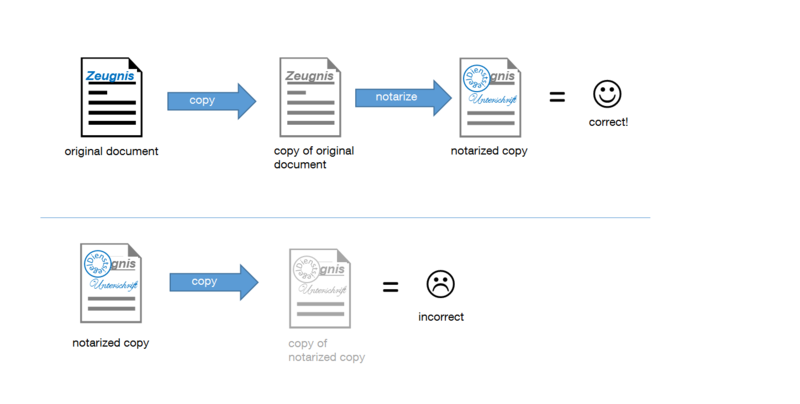 What does official notarization look like? We only accept notarized copies with an official seal and authentic signature. A copy of an officially notarized copy, as well as scanned documents are not considered to be notarized and must be officially re-notarized. Otherwise they will not be recognized. Please note that a sealed letter or envelope does not substitute a notarized copy. TUM does not accept digital administrative signatures, certifications or verifications. Who has authorization to issue official notarization? In no case will we accept notarizations from private individuals, lawyers, a priest's office, banks or the AStA (student union executive committee)! Which qualities must an official notarization have? Statement of authenticity indicating that the copy corresponds to the original. Original signature of the notary confirming the statement of notarization. Official seal, usually round or oval, containing an emblem (e.g. official crest) and the name of the authority. A simple ink stamp is insufficient! (see figure 3) A notary without an official seal is not qualified to notarize your documents! It is sufficient for one page to carry the statement of authenticity and signature, provided that all pages are arranged and affixed so that they overlap and each shows part of the official seal (see figure 2). You may have each page notarized separately. In this case, your name must appear on each page of the original. If this is not the case, both your name and a reference to the type of certification (e.g. university entrance qualification) must appear in the statement of authenticity on each sheet, clearly indicating that the pages belong together to constitute a single document. In no case may you add any missing information yourself! The statement of authenticity must refer to the front and back ("This is to certify that this page and its reverse side correspond to the original."). both the front and reserve sides of the sheet must be notarized separately. If you are already in Germany, please contact the embassy or consulate of your home country to have your documents notarized. Please ensure that your notarized copy complies with the stipulations as described on this page. Documents in English need not be translated. 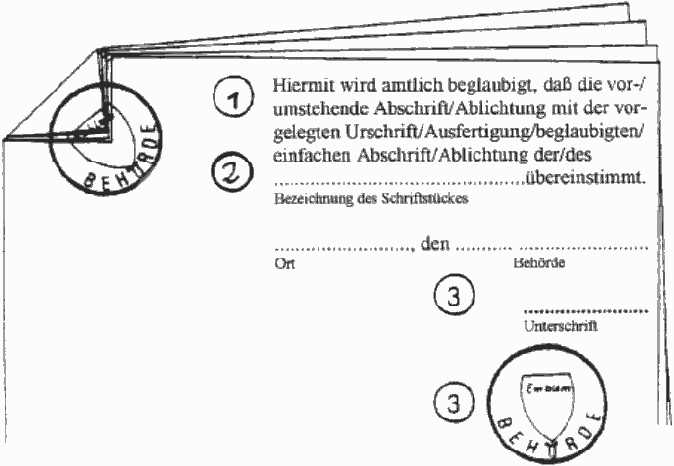 Documents not issued in German or English must be translated by a sworn translator and notarized with an official seal (Dienstsiegel). Please submit a notarized copy of both the original document and the translated document. Are there special rules for certain countries? Documents from the United Kingdom (UK) need to be notarized by a notary since the universities do not notarize themselves. Notarized copies from China require the red round seal and the round embossed seal of the university or the notary. Notarized copies from Georgia must bear an apostille (additional authentification of notarized documents for international purposes). The apostille must appear on both the Georgian-language original and the translation. When applying for a degree program at TUM, documents issued by TUM itself do not require any further certification. You have successfully completed your studies, and would now like to have your degree varified - for instance for a future employer? Here we have compiled everything you need to know.